DUX is a new horizontal shooter, featuring bold and colourful high resolution graphics @ 60FPS, developed by part of the team which created Last Hope. Like Last Hope, it's a "memorise type shooter" and there are obvious references in style to R-Type, but it has been designed to be a lot more friendly and forgiving than Last Hope.... perhaps in some ways it will be to Last Hope what R-Type Leo is to the R-Type series. R-Type fans will no doubt go nuts over this, but for everyone else, you don't need to go and finish Pulstar on a single credit just to prepare yourself in training for the 1st level! 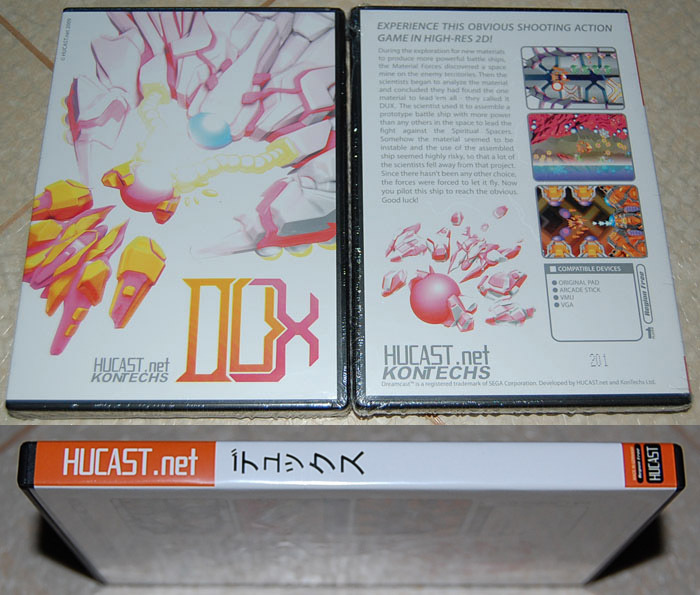 The game comes in a DVD-style box, like most of the last Dreamcast releases. Limited Edition version of the game is limited to 500pcs production. Features an Original Sound Track CD (different to the Obvious Sound Track CD which is available separately), inside a 2 disc DVD case with orange borders and the name written in Katakana to match the official Japanese Dreamcast games. On the back of the box is a production number between 1 and 500. Note: a small bug has been found in Dux. It ONLY rears it's ugly head on PAL Dreamcast consoles and even then, there is no problem with PAL consoles if you are using VGA. However, if you are using RF, Composite Video, S-Video or RGB, then shooting one of the enemies will give you an insanely high score. A patch disc should be released by the end of July. If you require the patch disc, please either email us or mention it in the 'additional comments' box when ordering. Also mention if you want us to hold off on shipping the game until the patch disc arrives. Otherwise we will send the game immediately and send the patch disc as soon as it arrives. IN STOCK NOW, REGION FREE! If you have already placed an order for the regular version of the game and would like to upgrade to the Limited Edition, please call or email us. The regular edition should be arriving within the next few days.